Most of the tests and inventories provided on this site require "active content" in order to calculate your results and prepare your report. If you wish to complete any of the tests and inventories involved, you may need to enable active content. How will I know if I need to enable active content? 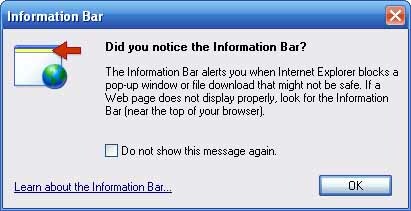 1) When the "Did you notice..." message box (that is shown above) appears, click the "OK" button. 1. You may need to repeat the same procedure for other tests because the steps listed here only permit active content on the page displayed, in order to leave your computer protected from other, unwanted active content. 2. If you are taken back to our "Welcome" page, simply (re)click the link for the test you want. Doing so will deliver you to the test of interest. It should then work properly, and no additional message boxes should appear. begin again, following the above steps if necessary.